In the winter of 1887, Sherlock Holmes and Dr. John Watson made their grand debut in Beeton’s Christmas Annual. Ever since then, Sir Arthur Conan Doyle’s characters have been the undisputed masters of literary detection. Besides Conan Doyle’s original canon, which ran from 1887 until 1927, Holmes and Watson have featured in numerous radio, stage, and screen adaptations. In fact, Holmes is the most portrayed fictional human in the history of cinema (his only competition is Count Dracula, who’s not exactly human). Holmes’s enduring popularity can be chalked up to many things. In some cases, he’s the resolute and firm answer to political or social chaos, while at other times he plays the human magician who can deduce your life story from a speck of dirt on your trousers. As a result, many writers from around the world have created their own Holmes-like detectives. These characters exemplify Holmesian aesthetics (quirky eccentricities matched with a reserved demeanor) and sharp logic, even though they inhabit cultures ranging from Victorian London to 20th-century Japan or medieval Italy. Created by the Georgian-Russian writer Boris Akunin (real name Grigory Chkhartishvili), Erast Fandorin is a high-ranking police inspector and sometime government official in Tsarist Russia. In his native land, Fandorin is an immensely popular literary hero and the subject of several feature-length films. He will also soon be coming to the small screen in a planned British television show. There are 13 Fandorin books in total, some of which have yet to be translated. Sadly, there won’t be any more than that, since Akunin retired from writing in 2013, after selling around 18 million books. A philologist and specialist in the Japanese language, Akunin (a name derived from the Japanese word for “villain“) created the historical series in order to explore the different narrative styles of several famous authors. For instance, his 1998 novel Murder On The Leviathan, which takes place on board a passenger ship swimming with exotic intrigue, is clearly written in the style of Agatha Christie. Likewise, Fandorin himself, who is described as a polymath turned eccentric gentleman adventurer, bears more than a passing resemblance to Mr. Holmes. Like Holmes, Fandorin is a coldly logical investigator who often undertakes cases for private reasons. Also like Holmes, little is known about Fandorin’s parents, except that his father was a military officer in the Russian army. In some ways, Fandorin seems like a combination of Holmes and his brother Mycroft, a mysterious official in the British government. Whatever the case, Fandorin is without question Russia’s most beloved literary detective. While Akunin used Holmes as a loose template for Erast Fandorin, Solar Pons is such a close pastiche that he and Holmes are almost identical, barring the sharp differences in popularity and name recognition. Sherlock Holmes and Solar Pons both live in London (the former on 221B Baker Street, the latter at 7B Praed Street) and associate with doctors who double as their biographers (Dr. Watson and Dr. Parker). Holmes’s older brother is Mycroft, while Pons’s elder sibling is named Bancroft. The two detectives even share similar landladies, with the more famous Mrs. Hudson becoming Mrs. Johnson in the so-called Pontine canon. Created by pulp writer August Derleth, best known for his association with horror heavyweight H.P. Lovecraft, Solar Pons hit the literary world in 1928, the year after Arthur Conan Doyle finally quit writing Sherlock Holmes stories. In a bold move, the 19-year-old Derleth wrote to Conan Doyle and asked for his permission to pen some Holmes stories of his own. When his request was politely declined, Derleth decided to create his own version of the character—despite being a teenage Wisconsinite who had never been to London. In contrast to the old-fashioned Conan Doyle tales, Derleth’s Solar Pons stories take place during the 1920s and ’30s and feature all sorts of technological gadgets. Derleth also frequently dipped into his pulp roots to pit Pons against villains like Sax Rohmer’s Fu Manchu. Similarly, Derleth indulged his love of horror fiction by giving Pons more outre cases than Conan Doyle ever gave Holmes. This tradition was carried on by Basil Copper, a British newspaperman and horror author who wrote and revised Pons stories from 1971 (the year of Derleth’s death) until 2005. In honor of Holmes’s Baker Street Irregulars, fans of Solar Pons currently maintain a small group known as the Praed Street Irregulars. Taro Hirai was a young Japanese fan of Western mystery fiction during the 1920s. At the time, few of Hirai’s favorite stories and novels had been translated into Japanese. To make matters worse, Japan did not have much of an indigenous detective literature tradition. So Hirai set out to write his own mysteries. Using the pen name Edogawa Rampo, which is a Japanese rendering of “Edgar Allan Poe,” Hirai ended up crafting some truly bizarre stories. His most infamous tale, The Human Chair, speculates about what would happen if a famous mystery writer received a letter from a grotesque criminal who had somehow managed to live inside of a plush armchair. This story and others have been frequently used by manga and anime artists, thus helping to keep Rampo’s legacy alive in modern Japan. Rampo’s detective fiction remains popular as well, especially his stories featuring the private detective Kogoro Akechi. Originally written as an impoverished student with incredible skills as an investigator, Akechi developed into a debonair Holmes pastiche and is now a staple of detective mangas, anime films, and TV shows, rivaling Holmes himself in terms of popularity. A calm, cool, and completely rational detective, Akechi is adept at solving seemingly impossible cases involving some truly strange and disturbing murder methods. Akechi’s chief rivals include the master thief known as The Fiend With Twenty Faces and a deadly femme fatale dubbed The Black Lizard. The latter villain, the antagonist in Rampo’s 1934 novel The Black Lizard, made her screen debut in 1968, in a film remembered for featuring a performance by Yukio Mishima, a celebrated writer and poet who committed seppuku after leading a failed coup in 1970. Although originally created by Harry Blyth, Blake was written and drawn by a wide variety of authors and artists during the era when he was regularly published in Detective Weekly magazine. As a comic strip character, Blake moved away from his origins as a Sherlock Holmes clone and began to take on the characteristics of a pulp vigilante. In particular, Blake became far more action-oriented than Holmes, with cases involving international gangs and exotic locations. He also fought an increasingly creative army of villains, including the invisible Mr. Mist, the spooky Miss Death, and Dr. Satira, who could control animals with his mind and once ruled over his own hidden city of super-intelligent apes. No stranger to adaptation, the first Sexton Blake stage play debuted in 1909. Since then, the character has appeared in films, on radio programs, and in a British TV series that ran from 1967 until 1971. A collaboration between Japanese and Italian television networks, Sherlock Hound ran for 26 episodes between 1984 and 1985. The show featured Conan Doyle’s familiar characters as anthropomorphic dogs living in a steampunk-style neo-Victorian milieu. While most episodes featured completely original stories, some, like “The Speckled Band,” did try to remain somewhat faithful to the Conan Doyle originals. Notably, Sherlock Hound featured the work of renowned Japanese animator, director, and writer Hayao Miyazaki, who directed the first six episodes. Rarely considered one of Miyazaki’s finest works, Sherlock Hound was nonetheless heavily promoted by its Japanese and Italian producers and achieved some success as a result. The show did leave one lasting legacy by introducing Miyazaki to Marco Pagot, a representative of the Italian RAI television network who helped inspire Miyazaki’s classic Porco Rosso, in which an Italian fighter ace named Marco Pagotti finds himself transformed into a talking pig. Dickson began his career as a German pulp detective hero during the first decade of the 20th century. At first, the character was literally just called “Sherlock Holmes,” but legal concerns soon caused the original German publishers to euphemistically rename him “the King of Detectives,” although he was clearly still intended to be Holmes. In 1927, a Dutch translation made some changes and dubbed the character “Harry Dickson, the American Sherlock Holmes.” A year later, the Belgian pulp writer Jean Ray was hired to do a similar translation into French. By about issue 20, Ray started injecting his own ideas into the series, mostly inspired by his background as a horror writer. Similar to the evolution of Sexton Blake, Ray’s Harry Dickson transitioned from a Holmes ripoff to a pulp action hero, battling a cast of malevolent villains who skirted the line between human and supernatural. Reinforced by magazine covers that featured dazzling artwork, Ray’s Dickson stories and short novels (of which he wrote at least 180) became very popular during the 1930s. Dickson’s legacy proved so enduring that celebrated French film director Alain Resnais attempted a big-budget Dickson film in the 1960s, which failed to get off the ground. Sadly, most of Ray’s Harry Dickson novels have yet to be translated into English. As with most popular characters past and present, Sherlock Holmes has frequently been the subject of ridicule. Given the character’s haughty demeanor and his ability to solve even the most baffling cases, it’s clear to see why so many fans and fellow writers like to take potshots at him. One such instance occurred in 1902, when American writer Bret Harte published “The Stolen Cigar-Case” (which you can read here) in Pearson’s Magazine. Harte is better known for penning tales about rugged individuals in America’s Wild West, but his Sherlock Holmes farce was a hit, with the detective-writing duo collectively known as Ellery Queen dubbing it “the best parody of Sherlock Holmes ever written.” In the story, written in Conan Doyle’s classic style, Hemlock Jones tries to explain why he believes that the Watson-esque narrator has stolen his cigar box. Adding to the comedy is the fact that Hemlock Jones makes several obvious deductions throughout the story, such as deducing that it’s raining outside because the narrator’s umbrella is wet. This is only natural considering that the character’s very name is supposed to invoke the poison that the philosopher Socrates supposedly drank in order to commit suicide, thus symbolizing the death of an intellect. In the end, after several breathless attempts to convict the narrator of stealing his prized cigar box, Hemlock Jones is revealed to be a blowhard who never even bothered to look for the missing cigar box in the first place. Despite this, the narrator spends the entire story enamored with the detective’s overblown abilities. Like Hemlock Jones, Herlock Sholmes was a parody of the great detective created by a master fiction writer. In this case, the character was devised by Maurice Leblanc, best known as the creator of another of the period’s great characters: Arsene Lupin. A gentleman thief and a dandy who frequently robs members of high society, Lupin’s popularity rivals that of Sherlock Holmes in his native France. A year after his debut, Lupin faced off against Holmes (or rather “Herlock Sholmes”), in a series of short stories that were collected together as Arsene Lupin vs. Herlock Sholmes. 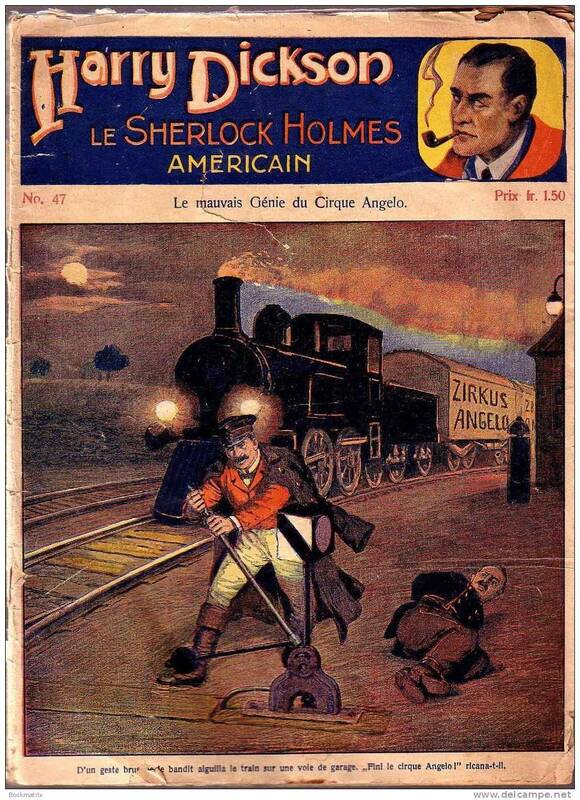 While early-20th-century Brits favored detective heroes in their fiction, the French tended to enjoy criminal protagonists such as Lupin and the surreal serial killer Fantomas. Given this difference, Lupin’s friendly game of wits with Herlock Sholmes can be read as a playground competition between two great powers and their respective ideas about popular literature. Of course, Leblanc, as a proud Frenchman, could not let the British Sholmes get the better of his own creation, so Arsene Lupin vs. Herlock Sholmes is littered with moments where Lupin eludes and outsmarts the brilliant detective. The pairing proved so popular that a PC game with the same title was released in 2008. Unlike Leblanc’s original stories, the game does not parody Holmes and makes the fight far more even. The protagonist of one of the longest-running mangas in history, Jimmy (or Shinichi, if you prefer) Kudo is arguably Sherlock’s biggest fan. Created by manga artist Gosho Aoyama, Kudo is a teenaged amateur detective who uses the alias Conan Edogawa (a reference to both Sir Arthur Conan Doyle and Edogawa Rampo) after a villainous organization turns him into a small child (it’s a long story). Kudo heads the series Case Closed (also called Detective Conan), which is Aoyama’s tribute to Sherlock Holmes and detective fiction in general. In Kudo, Aoyama created a precocious and active investigator who apes the quirks commonly associated with Holmes. For instance, both characters play the violin and Kudo is frequently depicted wearing Holmes’s trademark deerstalker cap and cloak. Despite selling an astonishing 140 million copies of its 85 volumes, Case Closed is still only the fifth best-selling manga of all time. Published in 1980, The Name Of The Rose immediately captured the attention of readers around the world. The debut novel by Italian academic Umberto Eco, The Name Of The Rose chronicles a murder case that unfolds in an Italian monastery in 1327. Although notable for its use of literary criticism and semiotics as part of the plot, Eco’s novel also features a rather unique detective named William of Baskerville. A Franciscan friar from England (supposedly modeled after the historical figure William of Ockham), William of Baskerville displays all the ingenious methodologies of Sherlock Holmes, while at the same time maintaining a sense of Christian humility that proves integral to the plot. Making Catholic clergymen into detectives was nothing new in 1980. Seventy years earlier, G.K. Chesterton published The Blue Cross, a detective novel featuring a humble Catholic priest named Father Brown. Chesterton intended for Brown to be Holmes’s opposite in almost every way. While Holmes emphasizes cold logic and an emotionally detached approach to solving crimes, Brown uses intuition and his knowledge of the human soul as his main weapons. While Holmes is the product of the Enlightenment, Father Brown is a throwback to the religiosity of the Middle Ages. William of Baskerville, whose name references the beloved Sherlock Holmes novel The Hound Of The Baskervilles, combines Father Brown’s intimate knowledge of human sin with Holmes’s eye for scientific deduction. Aided by a Watson-like assistant named Adso of Melk, William eventually solves the riddle of the monastery using several different scientific disciplines. In 1986, the book was made into a film of the same name starring Sean Connery. Benjamin Welton is a freelance journalist based in Boston. His work has appeared in The Atlantic, VICE, The Atomic Elbow, Metal Injection, and others. He currently blogs at literarytrebuchet.blogspot.com. Benjamin Welton is a West Virginia native currently living in Boston. He works as a freelance writer and has been published in The Weekly Standard, The Atlantic, Listverse, and other publications.